Home Posts tagged "digital comics"
Archie Comics is proud to team with Humble Bundle on a new Riverdale & Archie Comics Humble Bundle! 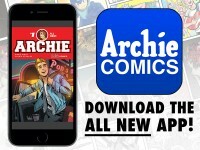 Archie Comics gives fans 100 free digital comics via the new Archie app and the chance to unlock 100 more! Your Guide To The New Archie Comics App + Learn How To Get 30 Free Comics!